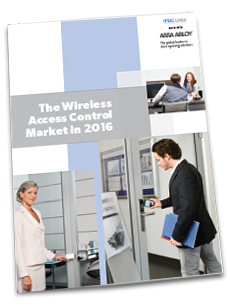 A collaboration between ASSA ABLOY, IFSEC Global and IHS Research, this report offers a comprehensive overview of the wireless access control market, providing detailed analysis of the latest survey results and independent insights into the access control market’s future direction. The report also highlights the many benefits of wireless access control and the huge opportunities ahead as usage spreads to server cabinets, perimeter fences and other applications across many business areas. It helps to dispel fears on the cost of installation and maintenance, demonstrating that cost efficiency, easy maintenance and higher security are key drivers of this fast growing technology. Blake Kozak, principal analyst with the Security and Building Technologies Group at research consultancy IHS, has provided independent insights throughout the report. ASSA ABLOY’s portfolio director for digital access solutions on the EMEA portfolio Markus Henkelmann, also offers his viewpoint in every chapter. For businesses that may be looking to invest in a new system or expand their existing control systems, this report makes essential reading. Download the report to read the true facts about wireless access, enabling you to make informed decisions for the future. 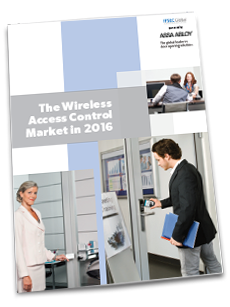 Download: The Wireless Access Control Market in 2016 Sponsored by ASSA ABLOY the Wireless Access Control Report 2016 examines the installed base, the merits of wireless versus wired systems and training requirements, among other things.